UPDATE March 6 2012: I have just scanned and uploaded the finished crest, see below. Barbara has just dropped the new ring with the raised crest cutout into the master engraver for the finishing flourishes and burnishing. 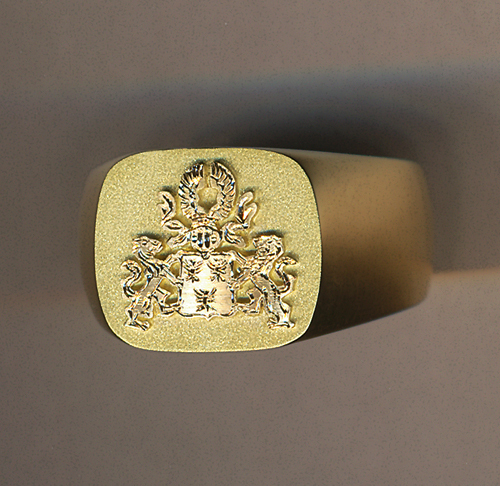 Handmade 18ct Yellow Gold ring following his Father’s ring and continuing another family tradition. 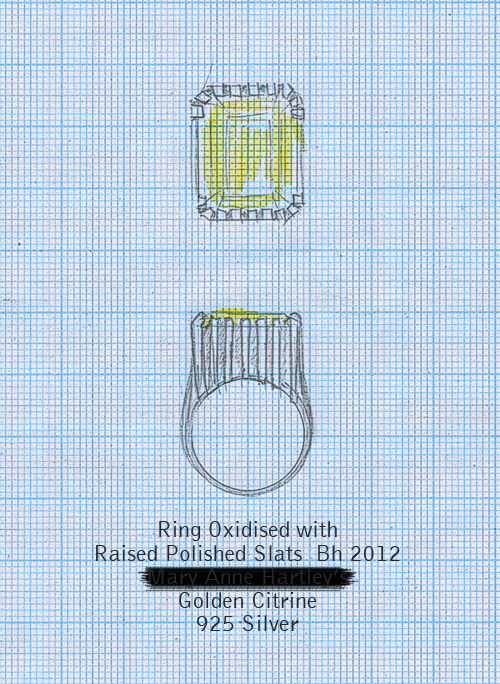 And what’s more we are also working on a wonderful Diamond ring that Juan-Luis is setting right now for Deidre. All initiated by John, another family affair here at Jeweller to the Lost, Brisbane Australia. Erin received her pendant and handmade chain last year and John collected Bessie’s pendant today. 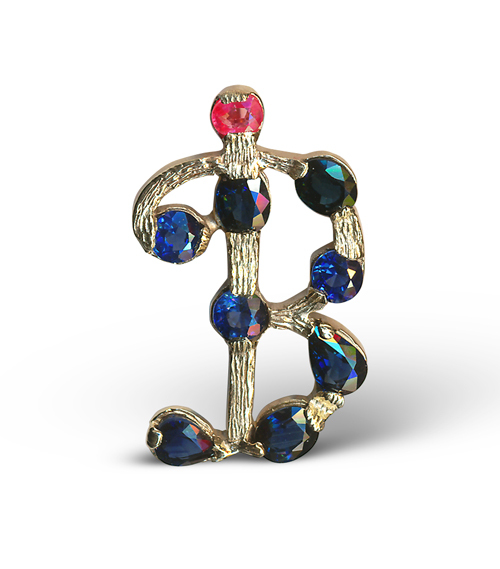 Their Mother had a gem letter D made by another jeweller years ago and the family tradition was to keep the concept alive once the girls left the security of the family home. 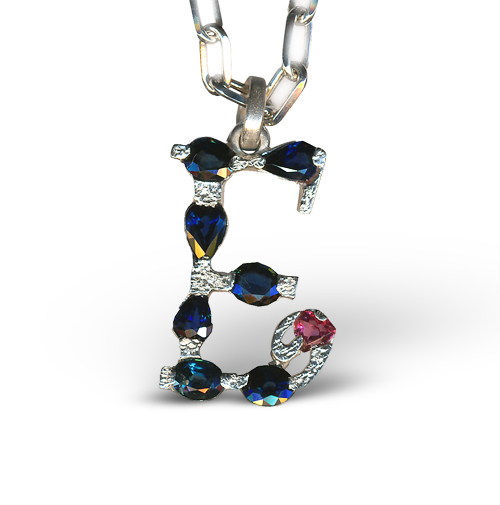 Erin lives in Japan now and her one was 9ct White Gold with Sapphires, Bessie’s is 9ct Yellow Gold with Sapphires also. Bebe Senior in the 1970s and Bruce McLeod in the 1990s were the two dealers where these Chinese Monochromes were mostly sourced. Items from the scholar’s table have always been a focus of mine while earlier best examples – ‘sang de boeuf’ ox blood glazes of the Kangxi period (1662–1722) are rarely found locally these days. The ‘flambé’ vase with elephant shoulder medallions is a perfect example of late Guangxu reign (1875–1908) and was found in Shirley McLeod’s stock at Ian Thompson’s New Farm Antiques Centre. In fact the piece even had an old sticker with Bebe Senior’s un-mistakable handwriting, a real find and a Christmas present to myself. This chop-up photograph is rough and makes the Victorian Chippendale cabinet from Michael Allen look a bit bulbous but you get the drift, I hope. 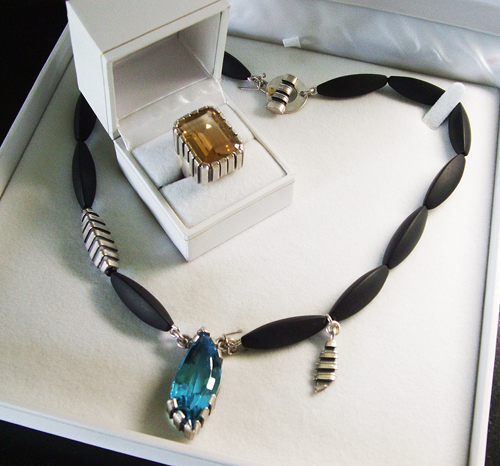 Leigh Phillips is a long-term client who has purchased Barbara’s pieces for his wife Cynthia and for himself. The annual studio sale brings them to Brisbane and sales are made and commissions are started. 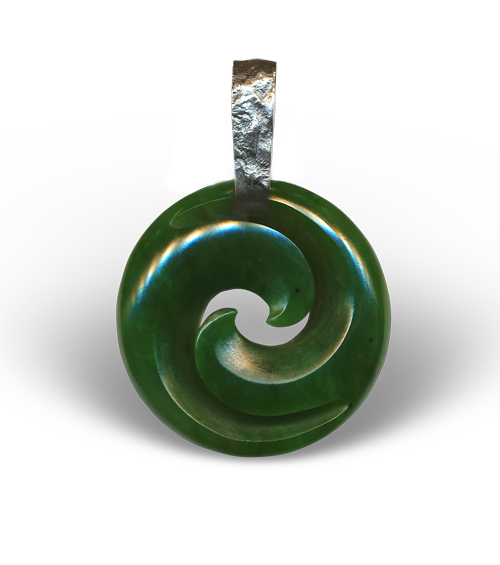 Leigh wanted a chain and a bale made to wear his New Zealand carved Jade piece, shown above. This is a great design, not only circular in shape but with an exquisite wave motif mirrored to contain and hold the power. Barbara made a handforged silver bale and did the reticulated surface to match another pendant and necklace Leigh bought from our Studio stock, shown below. Again, Leigh scooped the stock sitting here about to be consigned to our web-based retailer. 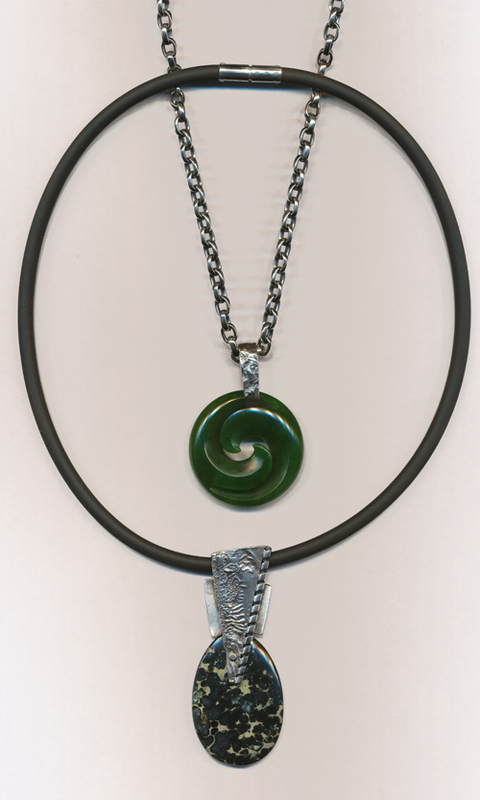 The Silver pendant is all hand forged and reticulated with a large oval polished piece of Variscite from the Candalaria Mine in Nevada, supplied by Richard & Helen Schull from ‘out of our mines‘. The parcel with two large coloured gems arrived in the post with a note asking what they were and what could Barbara do with them. First thing we did was ask our gem valuer for his opinion, which was offered without a certificate or a fee. Yes they are both genuine, the large Golden Citrine with the Emerald Cut was 21.93ct and the Swiss Blue Topaz weighing in at 32.76ct. 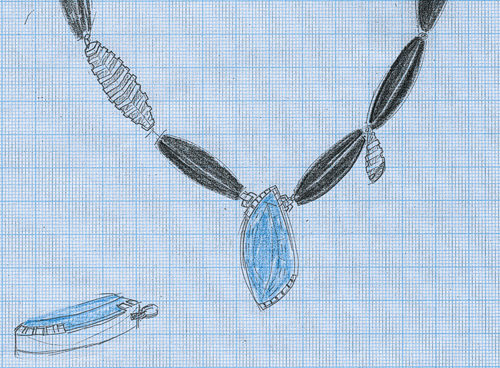 Barbara started with an idea that both required a tall box setting to protect the stones and worked up a raised Chenier style with a new feature she has called Box Setting with Strap Claw. Reminiscent of that Tasmanian wooden cladding called ‘hit and miss’ that we so cherish. The two designs (below) were drawn and quoted and emailed off to Melbourne and an ensuing quick response which said “please proceed & when can we expect them?” Three weeks turn-a-round was our response and here they are all into the world and ready to be worn, thanks to MAH. Warwick Oakman is a practicing architectural historian & high class antiques dealer in Hobart, Tasmania. We are leaving his own words sent to us in an email this morning, as the copy for this post. As you can see “he really gets it” . . . I am still not quite sure what I have done to deserve knowing you guys. I have just got my white gold and ruby house cufflinks from Handmark. I keep wearing them. Everything about them is ultra considered – but not fussy or too slick. Extra meat and depth of metal. Proportions work. They speak of the human you wish to be. I am doing extra sit-ups each day to look extra smooth. I can sorta see why people flip camps from going from antique to new when you come across something with this level of intent and resolution. I have been sitting them up in the box in front of the dinner plate and cant stop staring at them. Bizarre behaviour! – Thankyou. Shown above are the solid yellow gold pair, Warwick has the solid white gold ones © Bh 2010. The link to Barbara Heath’s work at both Hobart & Evandale – Handmark Gallery is – here. 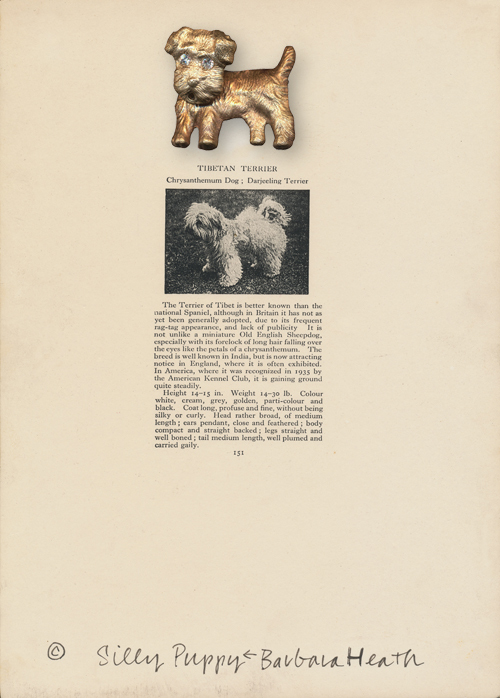 I remember Thomas Vale-Slattery was escorting his holiness around the exhibition, he stopped and looked and turned the head of the brooch and laughed (as he is known to do) it was certainly the only thing I saw him touch all evening, what fun! 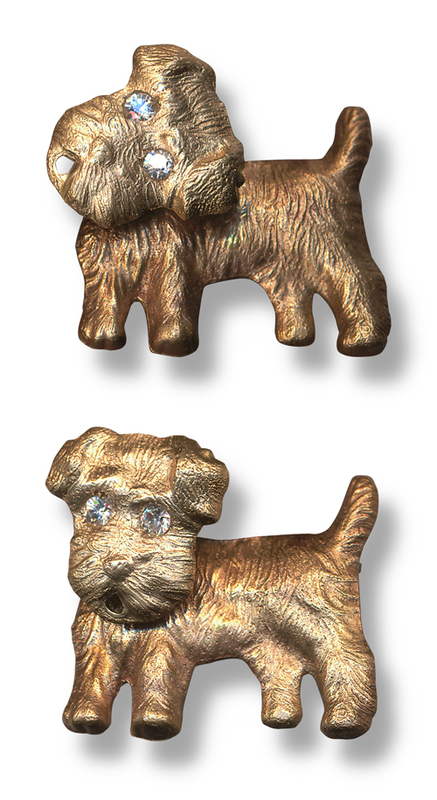 The articulated bronze brooch © Bh with cubic zirconia set eyes and stainless steel brooch back, 1993. The occasion also marked the launch of the University of Queensland Art Collection Online – go here or jump to my ‘collection residual gift’ page, here. Dr Campbell Gray’s team with the online main man, Sebastian Moody are in the process of making this happen across the 3000+ art works in the collection. 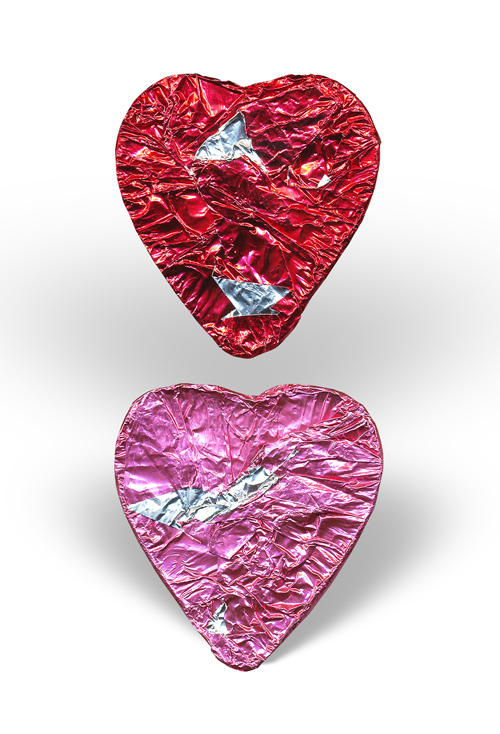 The individual seating at last night’s dinner had these foiled chocolates, I always like the other side, a reverse twist, the hidden or shadow part of the equation. A boxed set of cards and envelopes with an •image by Dr William Yang (Willy Young to those of us locals with a memory) was also given to guests. – *somebody loves me 2009. By the time Barbara Heath visited Horsham, the town and the surrounding Wimmera District of Western Victoria were in the process of recovering from a decade-long drought. To inform her work, which was initially to address issues of drought, Heath held a number of planned and fortuitous conversations with the assistance of Horsham Regional Art Gallery staff, which came to focus on the changes in agricultural practices in the area. The list of people with whom Heath consulted is lengthy, but Dr Bob Redden, curator Australian Temperate Field Crops Collection of the Grains Innovation Park became her main contact. In an email of August 2011, Dr Redden wrote to Heath: ‘Now with unprecedented population levels and growth, there is a risk of disconnect and taking food supply for granted, even with climate change. Humans will need to change if they wish to continue their increasing diverse interests, but will need to prioritise agricultural research, better understanding our available genetic resources, plant growth and development, and imaginative paths to harnessing science and truly earn the title ‘Homo sapiens’. Land race is a direct response to the urgency of maintaining biodiversity. Agriculture today requires economies of scale that change the social landscape and limit population diversity. This results in the erasure of many small communities, loss of connection to the past and cultural loss. Dr Redden explained his department’s work to ensure plant gene diversity by sourcing and saving seed from land race crops. ‘Land race’ is the term used to describe heritage seed varieties now being displaced by International Seed Uniformity Standards. Heath’s Land Race series shows distinct levels, from biodiversity in the soils to the patterns of farming practices above. Each Land Race also features a remnant plant species that reaches up and through the tractor track patterns: briar, apple and aloe. There are numerous hero shots (one above) and details prepared (below), we will wait for the show to get under way and publicise a little later. The preliminary research is in an earlier blog post – click here. Michael Allen and Vanessa Roche have many special objects, some were gathered together, more pieces were added and the studio made this baby rattle for their most special valuable – Lucinda Rose Allen. The bone pieces were already held with the silver riveted jump rings, Juan made the large textured ring and two of Barbara’s loaded symbols were employed for the piece – an ‘infinity symbol’ and the seal symbol ‘carpe diem’ + a hand-stamped date reminder, all fastened with similar riveted jump rings.